(Welcome Back…) On the other side, unfortunately, not every leader thinks about this, doesn’t know how, nor necessarily cares. Assumption #1: You have a viable plan – a vision – the right people and a roll-out strategy (includes, “know your audience” – and, questions like, “Who will it serve?”). 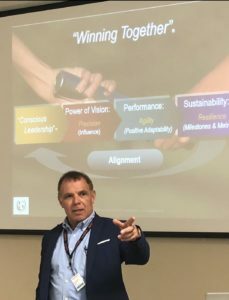 Assumption #2: As an executive, manager or team leader – as a person who leads others – you’re in alignment with the broader business goals, values, growth strategy (big-picture), and you care about the right things. Reasonable characterization? In essence, you’re bullish on business, financial and professional development, margins, brand distinction, market expansion and quality, etc., right? In a global business economy where creativity, clarity of direction and innovation drive next level growth; where systems, supply chain and diverse global markets (not to mention cultures), require a heightened level of persuasion; how do you achieve REAL “buy-in” to your plan, direction and/or vision? My “real” answer? Belief. You attain stake-holder “Buy-In,” by “inspiring” people to believe in something bigger than ourselves…a cause…a purpose. It’s the “Why?” behind what drives us. Further, it taps into a knowingness that the result will benefit them, and contribute to the whole. Maybe a Spiritual thing? Here’s a metric for you…Morale. Is this important? If so, why? And, how do you achieve it? Consider your outcomes…short-term gain, long-term results? Are you on mark, or missing your targets? What’s the root cause and who’s to blame? Here’s where most MSU (make stuff up). In the spirit of Conscious Leadership, I’ll refer to the title of my upcoming book, “Being on Purpose.”® – this beingness, collectively, unifies your target audience through that ephemeral and elusive state called, “Synergy.” CAUTION: Here is where leaders miss the boat – they intellectualize what I just said and, “Get it,” because they understand the words and concepts, but don’t really capture its power. (Please look for Part II – Nov. 18, 2018).